Indonesia's highest court has ruled an anti-terrorism law used to convict the Bali bombers was applied illegally. The law was enacted in the wake of the Bali bombings that killed 202 people. It was then used to prosecute those arrested in connection with the attack, but the court now says the law should not have been applied retroactively. There is confusion about whether this latest ruling could overturn the convictions of those already tried for the 2002 blasts. A court official said the ruling itself cannot be applied retroactively and so will not apply to those already convicted. But one defence lawyer told the BBC he would use the ruling to appeal 27 of the Bali convictions. Two men have chosen not to appeal, and the three main players - Mukhlas, Imam Samudra and Amrozi - have all already had their appeals dismissed by the Supreme Court. The ruling came during an appeal by Masykur Abdul Kadir, who was sentenced to 15 years in jail for his role in the blasts on the resort island of Bali. His lawyers argued that Law Number 16, which allowed a broader piece of terror legislation - Law Number 15 - to be used retroactively, was invalid. The court accepted the appeal. "We hereby declare that the law, Number 16, 2003, ... is in contradiction with the 1945 constitution; that the law, Number 16, 2003, does not have binding legal force," said Jimmly Asshidique, chief judge of the Constitutional Court. A legal assistant to the court, Muhammad Asrun, told reporters the ruling did not affect the verdicts over the Bali bombings. "This decision does not annul the convictions against Amrozi and his friends but in the future, the anti-terrorism law will no longer be enforceable after this decision," he was quoted by AFP news agency as saying. This means it could jeopardise attempts to convict Indonesian Muslim cleric Abu Bakar Ba'asyir of terrorism. Police recently said they had new evidence to show he was the senior leader of militant group Jemaah Islamiah, which has been blamed for Bali and a string of other attacks. 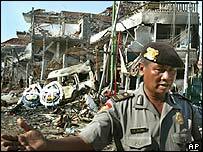 Thirty-two people have been convicted of the bomb attacks in Bali in October 2002 that killed 202 people, mostly foreign tourists. Three of the 32 - including Amrozi, dubbed the "smiling bomber" - have been sentenced to death, and 29 sentenced to between three years and life imprisonment. "What the court is saying is that the convictions of those Bali bomb suspects will still stand"